You can get crystal clear calls and uninterrupted 4G Lte data. The 4G Lte cell phone signal booster could only make the weak signal stronger,it couldn't generate any signal. So make sure the Outdoor Yagi Antenna towards the nearest cell signal tower,and could receive receive 2-3 bars of stable signal at the place where the outdoor yagi is mounted,or the cell phone signal booster couldn't work very well. 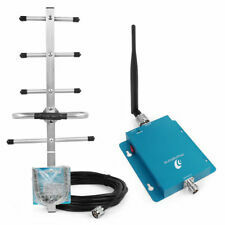 4G LTE 2G GSM / 3G / 1900MHz Cell Phone Signal Booster Repeater Amplifier Kit. 1 1900MHz Booster. How does it work?. Can I use the signal booster when the outdoor signal has 0 bar?. Significantly improves voice and data quality. How does it work?. Can I use the signal booster when the outdoor signal has 0 bar?. Ultra-Low Noise Receiver. You should get 2-3 bars of stable signal in the location where the outdoor antenna is fixed in, or the booster can't work. Works With All US Carriers. 1 Year Warranty. Phonetone booster provides a rapid and perfect solution to solve and optimize the weak signal of houses, offices, hotels, elevators, underground parking lots and other small weak signal area. Welcome you all to order. Any poblem? Pls do not hesitate to write an email to customer services to solve. We provide the best sale service and after sale service.Thank you. Small Size, Light Weight, Beautiful Repeater. 1 x 62dB Dual Band Repeater. How does it work?. Can I use the signal booster when the outdoor signal has 0 bar?. Ultra-Low Noise Receiver. What is the difference of different outdoor antennas?. Condition: (Open Box) The product comes with all its accessories. The factory seal of the product is broken. 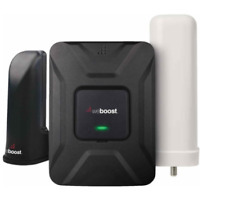 Description: Strengthen your cell phone’s data and voice connection with weBoost’s latest cradle booster - the Drive Sleek, Weboost's most powerful and versatile 4G cradle cellular signal booster for vehicles. 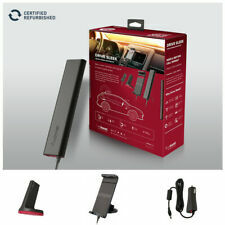 Use the Drive Sleek in your car, truck or any other vehicle to keep you connected. Place your phone in the cradle and get up to 32 times better cell coverage! Stronger signal means faster data speeds, clearer calls and even better battery life in weak-signal areas. Setup is easy! Our newly designed outside antenna sticks to the roof with a super strong rare earth magnet. For non-magnetic roofs, an adhesive disk to secure the antenna is included in the Drive Sleek kit. Included in the kit is a 5V / 2.1 Amp charging port. Trending at $169.99eBay determines this price through a machine learned model of the product's sale prices within the last 90 days. weBoost Drive 4g-x 470510 Cell Phone Signal Booster. Shipped with USPS Priority Mail. Small Size, Light Weight, Beautiful Repeater. What is the difference of different outdoor antennas?. If the outdoor signal is weak, you need the outdoor directional antenna which should be pointed to the base station to get signal, such as the outdoor yagi antenna, the outdoor LPDA antenna, etc. 1 1900MHz Booster. Significantly improves voice and data quality. How does it work?. Can I use the signal booster when the outdoor signal has 0 bar?. What do I need to know before ordering a signal booster?. Model 460108. This booster supports up to 4 devices simultaneously. This Single Band Booster is designed to work over the 3G 4G 850MHz, Band 5 on Networks used by VERIZON AT&T US Cellular. The amplifier will pass 3G 4G 850MHZ Calling signals back and forth where available when both phones in a conversation This results in a much clearer voice quality. Small Size, Light Weight, Beautiful Repeater. 1 x 65dB Dual Band850/1900MHz Repeater. Frequency Range. What do I need to know before ordering a signal booster?. Before ordering, you need to know your network operator frequency. SIGNAL BOOSTER: The we Boost Drive 4G-X RV 470410 Cell Phone Signal Booster boosts your 4G LTE and 3G signal up to 32X for fewer dropped calls, higher audio quality, and faster uploads and downloads. You should get 2-3 bars of stable signal in the location where the outdoor antenna is fixed in, or the booster can't work. How does it work?. Can I use the signal booster when the outdoor signal has 0 bar?. 1 1900MHz Booster. Significantly improves voice and data quality. How does it work?. Can I use the signal booster when the outdoor signal has 0 bar?. What is the difference of different outdoor antennas?. Signal booster provides a rapid and perfect solution to solve and optimize the weak signal of houses, offices, hotels, elevators, underground parking lots and other small weak signal area. Welcome you all to order. Any problem? Pls do not hesitate to write an email to customer services to solve. We provide the best sale service and after sale service.Thank you. The booster receives the outside signal from the outside antenna, amplifies it, and sends it to Drive Sleek cradle. The outside antenna reaches out to the closest cell tower to access usable voice and data signals. WeBoost Wilson Drive 4G-S Cell Phone Signal Booster for Car (Black) 470107. This item is open box to inspect the contents and in like-new condition. This unit is compatible with all carriers as it says on the packaging. 1 x Cell phone signal booster 850mhz. Emission Designator:GSM,CDMA(F9W),WCDMA(F9W). This car cell phone signal repeater booster could only work with Band 5 -850mhz. Compatible Carrier: Verizon AT&T Sprint U.S. Cellular. Standard Supported: CDMA, GSM. The cell phone signal booster can increase the signal strength, eliminate cell signal dead zones and provide crystal clear calls and uninterrupted 2G/3G data. and Compatible with Sprint 4G Lte 1900MHz Band 2 frequency. Max Gain 62dB±2dB 60dB±2dB. Single band 850MHz 60dB. This Single Band Repeater is designed for 850MHz Cellular Band;. 1 Indoor Right Angle Antenna. Ultra-Low Noise Receiver. Wilson Electronics Wideband Directional Antenna 700-2700 MHz 75 Ohm (314475). Condition is New. Shipped with USPS Priority Mail. Signal Repeater Booster. Tightly connect the 10m coaxial cable to the outdoor antenna and the OUTDOOR port of the repeater. Tightly connect the 5m coaxial cable to the indoor antenna and the INDOOR port of the repeater. weBoost (Wilson) 311155 (301155) 75 Ohm Wide Band Wall Mount Panel Antenna. Condition is New. Shipped with USPS Priority Mail. Trending at $61.54eBay determines this price through a machine learned model of the product's sale prices within the last 90 days. Indoor Omni Ceiling Antenna for Cell Signal Booster 698-2700mhz Full Bands. 1 x Indoor Omni Ceiling Antenna with 16 feet cable. The Indoor ceiling antenna is designed for mounting on ceiling, you can receive a wider omnidirectional signal coverage inside the house/ living room / small office. Works With All US Carriers. 2-year warranty. Condition: Used The product comes in original packaging with all the original accessories. It has been tested for functionality and cleared. Description: The weBoost 4G Connect is our most affordable 4G indoor signal booster. The 4G Connect allows users to get better voice and data signal with fewer dropped calls, improved voice quality, faster uploads and downloads. Our 4G signal booster increases cell signals up to 32x and enhances 4G LTE and 3G signals for buildings up to 5,000 sq ft. Compatible with all US networks, it works on Verizon, AT&T, Sprint, T-Mobile, US Cellular, Straight Talk and more. Installation guide available for download and all parts are included in the kit with trained support staff on call to assist. New 850MHz GSM 3G Cellular Phone Signal Repeater Booster Amplifier Yagi Antenna. GSM 3G 850MHz Cellphone signal Booster Repeater Amplifier with Yagi antennas. Single band 850MHz 62dB. This Single Band Repeater is designed for 850MHz Cellular Band ; It included everything you need to install. Proutone booster provides a rapid and perfect solution to solve and optimize the weak signal of houses, offices, hotels, elevators, underground parking lots and other small weak signal area. Welcome you all to order. Any poblem? Pls do not hesitate to write an email to customer services to solve. We provide the best sale service and after sale service.Thank you. KKBSTR Cell Phone Signal Booster, ATT T-Mobile Verizon Sprint 2G 3G 4G LTE. Shipped with USPS Priority Mail. Wilson 301201 Multi-band 75 ohm antenna. Phonetone booster provides a rapid and perfect solution to solve and optimize the weak signal of houses, offices, hotels, elevators, underground parking lots and other small weak signal area. Welcome you all to order. Any problem? Pls do not hesitate to write an email to customer services to solve. We provide the best sale service and after sale service.Thank you. The Repeater boosts cell phone signals for voice and text for all major carriers work on850MHz. Coverage in adjoining rooms will be reduced by walls and ceiling/floors. CDMA, GSM, 2G/3G etc. 1 Signal Booster. ZBoost Tri-Band AT&T 4G Cell Phone Signal Booster - 1850 MHz, 824 MHz, 704 MHz to 1990 MHz, 894 MHz, 746 MHz - CDMA, GSM, GPRS, EDGE, EVDO, UMTS, HSPA - 3G, 4G LTE. Product Line TRIO SOHO. Product Type Cellular Phone Signal Booster. Ft. with LCD has Part #F15G-5S-LCD. This is a wide band booster kit that amplifies signals of all cellular operators over up to 10,000 square feet with 65 dB cellular device reception gain. It can support up to 150 simultaneous users. Coverage in adjoining rooms will be reduced by walls and ceiling/floors. You should get 2-3 bars of stable signal in the location where the outdoor antenna is fixed in, or the booster can't work. How does it work?.